When you hear the phrase, “office politics,” what comes to mind? If you are like many, this idea draws strong reactions, including hate, disgust, annoyance, or for some, a bit of curiosity. Regardless of your feelings, office politics are a fact of life. 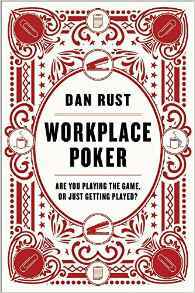 In Workplace Poker, Dan Rust suggests we either learn to play it or we are likely to be played. Minimize your own emotional reactions, and set aside preconceived notions, judgements, and expectations. You can’t get inside someone else’s head until you get out of your own. Learn to be a third-party observer. Notice how people speak, dress, act, and interact with others. You will gain a baseline of their behavior, which can be revealing and useful. Consider picking up a copy of Workplace Poker if you have ever experienced bumps or dips in your career trajectory. This resource can also prove useful in many community and non-profit organizations. This entry was posted in observation and tagged Barry Demp, Demp Coaching, observation, observer, perspective, The Quotable Coach by Barry. Bookmark the permalink.